Observations of 1 Ceres, the largest known asteroid, have revealed that the object may be a "mini planet," and may contain large amounts of pure water ice beneath its surface. The observations by NASA's Hubble Space Telescope also show that Ceres shares characteristics of the rocky, terrestrial planets like Earth. Ceres' shape is almost round like Earth's, suggesting that the asteroid may have a "differentiated interior," with a rocky inner core and a thin, dusty outer crust. "Ceres is an embryonic planet," said Lucy A. McFadden of the Department of Astronomy at the University of Maryland, College Park and a member of the team that made the observations. "Gravitational perturbations from Jupiter billions of years ago prevented Ceres from accreting more material to become a full-fledged planet." The finding will appear Sept. 8 in a letter to the journal Nature. The paper is led by Peter C. Thomas of the Center for Radiophysics and Space Research at Cornell University in Ithaca, N.Y., and also includes project leader Joel William Parker of the Department of Space Studies at Southwest Research Institute in Boulder, Colo.
Ceres is approximately 580 miles (930 kilometers) across, about the size of Texas. It resides with tens of thousands of other asteroids in the main asteroid belt. Located between Mars and Jupiter, the asteroid belt probably represents primitive pieces of the solar system that never managed to accumulate into a genuine planet. Ceres comprises 25 percent of the asteroid belt's total mass. However, Pluto, our solar system's smallest planet, is 14 times more massive than Ceres. The astronomers used Hubble's Advanced Camera for Surveys to study Ceres for nine hours, the time it takes the asteroid to complete a rotation. 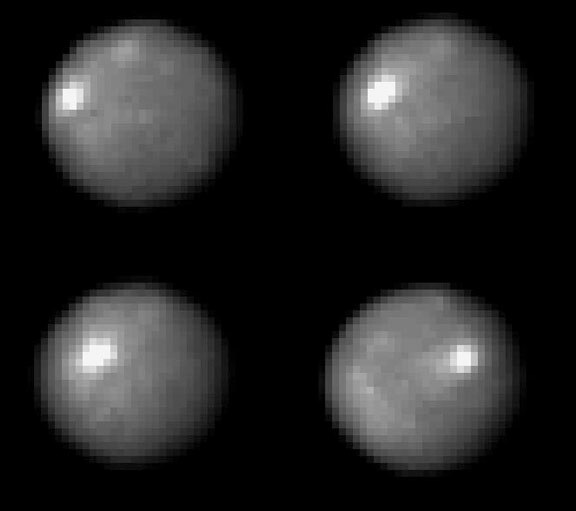 Hubble snapped 267 images of Ceres. From those snapshots, the astronomers determined that the asteroid has a nearly round body. The diameter at its equator is wider than at its poles. Computer models show that a nearly round object like Ceres has a differentiated interior, with denser material at the core and lighter minerals near the surface. All terrestrial planets have differentiated interiors. Asteroids much smaller than Ceres have not been found to have such interiors. The astronomers suspect that water ice may be buried under the asteroid's crust because the density of Ceres is less than that of the Earth's crust, and because the surface bears spectral evidence of water-bearing minerals. They estimate that if Ceres were composed of 25 percent water, it may have more water than all the fresh water on Earth. Ceres' water, unlike Earth's, would be in the form of water ice and located in the mantle, which wraps around the asteroid's solid core. Besides being the largest asteroid, Ceres also was the first asteroid to be discovered. Sicilian astronomer Father Giuseppe Piazzi spotted the object in 1801. Piazzi was looking for suspected planets in a large gap between the orbits of Mars and Jupiter. As more such objects were found in the same region, they became known as "asteroids" or "minor planets."